Congratulations, Niko! You will receive a confirmation email from my assistant, Julie, soon. Thanks for entering and happy reading! If you didn't win this time, the following giveaway is still open! Today, I welcome debut author Nikki Loftin to the blog for a round of Fast Five! Nikki is the author of the holy cow awesome THE SINISTER SWEETNESS OF SPLENDID ACADEMY which is in book stores now. Let's take a look at her book and then dive into the Fast Five. Lorelei is bowled over by Splendid Academy--Principal Trapp encourages the students to run in the hallways, the classrooms are stocked with candy dishes, and the cafeteria serves lavish meals featuring all Lorelei's favorite foods. But the more time she spends at school, the more suspicious she becomes. Why are her classmates growing so chubby? And why do the teachers seem so sinister? It's up to Lorelei and her new friend Andrew to figure out what secret this supposedly splendid school is hiding. What they discover chills their bones--and might even pick them clean! Doesn't that sound fun? I know my boys are looking forward to reading it! Want to grab your own copy? Head to Indie Bound, Barnes & Noble, or Amazon, or ask for it at your local bookstore. Now, let's see what Nikki had to say for her fast five! The Princess Bride is the perfect movie. Sword fighting, pirates, death, true love AND a six-fingered man? Bliss. I memorized the whole thing years ago, and now I make my own kids watch it with me all the time. Runners-up: Poltergeist, The Goonies, The Little Mermaid, and Resident Evils I, II, and III. (Um, does this list make me look insane?) - Inconceivable! Any insanity is cancelled out by including The Princess Bride! Pippi Longstocking is my all-time favorite. I STILL want to be Pippi. Also, I want a horse to live on my porch. And possibly a monkey, or a marmoset. Oh, I loved Pippi!!! I also wanted a horse on my front porch. My parents were less enamored with the idea. Runners-Up: Paddington Bear (for the marmalade), Frederick by Leo Lionni (the colors! ), The Lion, the Witch, and the Wardrobe, and... the Dragonsinger trilogy. Chocolate, preferably dark with almonds or some kind of nuts. Mmm. Dark chocolate. Runners up: Ice cream, gelato, sorbet, (Yes, these are all different foods! ), and for dessert, basil pesto on pasta. I'm beginning to see why you were uniquely qualified to write a book where candy and desserts are a theme unto themselves. Uh oh. Tricky. I watch almost NO TV! Gotta have time to write, and all. So it'll have to be oldies... Buffy the Vampire Slayer! A vintage dress my mom wore in the 60s that makes the wearer look like an enormous psychedelic flower! Runners up: Stacks of signed books waiting to be given to nieces/nephews for birthdays, a hand-sewn doll that looks just like me circa 1987 (creepy! ), a pair of silver and gold glitter-covered kitten toe high heels (worn once), and a purse that belonged to my great-grandmother, full of all the things she left in it before she died - white gloves, lace handkerchief, and antique Wrigley's gum! Whoa, my closet is cool. Sooo cool. Thank you, Nikki, for a fun Fast Five! What do you think of Nikki's choices? Are you loving her old school tv shows? Or do you think having a look-alike doll in the closet is taking the creep factor one notch too high? 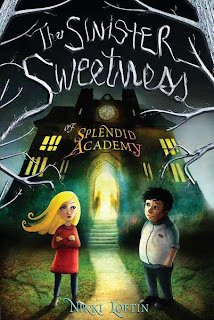 Leave Nikki a comment, and don't forget to check out THE SINISTER SWEETNESS OF SPLENDID ACADEMY!